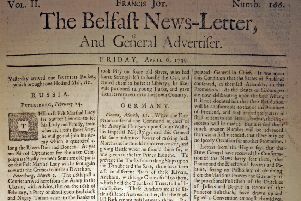 From the fourth surviving Belfast News Letter of December 22 1738 (January 2 in the modern calendar). Whoever intends to bid for it, may see the said Lease at Mr. Samuel Cromelin’s in Lisburn; as also a Lease of eighteen Acres more, for one Year, and the Lease of the Rectorial Tythes of the said Lands; any Person that want further Information may apply to Miss Flood, at said House or to the Rev Mr. Gayer in Carrickfergus: And that there may be no room for any possible Suspicion of unfair Dealing at said Cant, it is hereby declared, that no Person shall have a right to bid for the said Concern that will not given solemn Assurances to the Satisfaction of the Company, that he does really intend to purchase the same at the Price he then offers. There will be also sold, at the same Time and Place, Black Cattle, Horses, Hay, Corn, and Household Furniture, &c. for Ready Money: And on the Friday following, at Tullenore, will be sold the Corn, Hay, and Cattle on that Farm, and the Corn now stack’d on the Lands of Dree. All his Debtors are desired to have their respective Debts ready to be paid on said Day, or they must expect to be immediately sued for the same, without any further Notice. Dated this 13th of December, 1738. In the bad Weater (sic) on Saturday Night, a large Trow belonging to Mr. Stewart, bound up Severn with a valuable Cargo worth upwards of 2,000l. consisting of variety of Goods for the Tradesmen Northward, sunk in Kingroad, and the Vessel and Cargo entirely lost. The Men, with much Dificulty, sav’d themselves in their Boat. Two Regiments of Foot are ordered to March directly from the North to the West of England.